Even at 7am at Gatwick Airport North Terminal, the only thing I can find for breakfast is a tuna nicoise salad at Eat https://www.eat.co.uk . Don’t get me wrong, it was great to find something I could eat, but don’t you think Eat could offer a gluten free baguette or toast or something with a slight breakfast feel about it? Ray has his usual – a tuna baguette with mayonnaise and cucumber, (although he has to remove the cucumber since he can’t eat it). At least we were able to have tea with soya milk. On board the EasyJet http://www.easyjet.com/ flight, there was little on offer in its boutique “menu” that anyone with a food allergy could eat. The only symbols on the menu are “gf” (gluten free) and “v” (vegetarian). Gluten free food, on the other hand, was available and included Corkers sea salt crisps, real olives, 9Nine Carob raspberry and chia seed bar; Moma porridge with golden syrup; Kabuto rice noodles vegetable laksa and Joe & Seph’s Double Salted Caramel Popcorn. We ordered a cup of tea, but they looked at us strangely when we asked for soya milk. Fortunately we’d brought our own in 100ml bottles from Muji www.muji.com/uk/ As always, best to take your own food and drink for the flight. Getting from the airport to Amsterdam city centre is straight-forward – simply take the train to Central Station. There are plenty of self-service ticket machines so no need to queue – it’s around 10 euros one way – and trains run frequently. We then got a taxi from the station to the hotel which cost 20 euros, although you could get a tram. 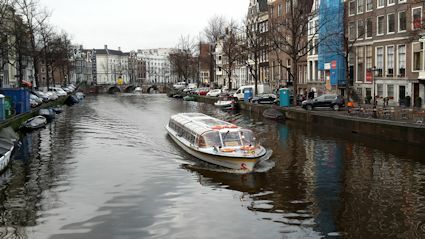 We stayed at the centrally-located Amsterdam American Hotel www.hampshire-hotels.com . This is one of Ray’s favourite hotels, dating back to 1880 when the first building stood on the same site. The original hotel, demolished to make way for the new one, derived its name from being designed in the fashionable American Grandeur style. When Ray was working in Amsterdam, he enjoyed dining in the well-known Café American because of its wonderful Art Deco style. Unfortunately it was being renovated when we stayed there, although we were allowed to take a peak at the renovations. 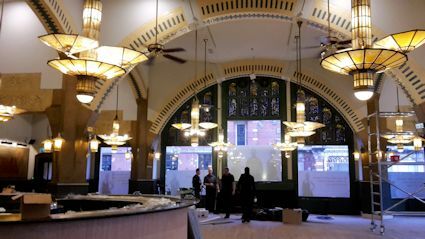 The art deco style lamps are still there – Ray hopes the new look café will be as stylish as before. The hotel has a fascinating history displayed in the hotel lobby; it’s a pity the owners don’t publish a book about it. In Amsterdam, most people speak excellent English so you can explain your allergies without having information a translation. But that doesn’t help you reading the labels of food products in shops. Here are some useful words – milk is melk; gluten free is glutenvrij and dairy free is zuivel vrij. 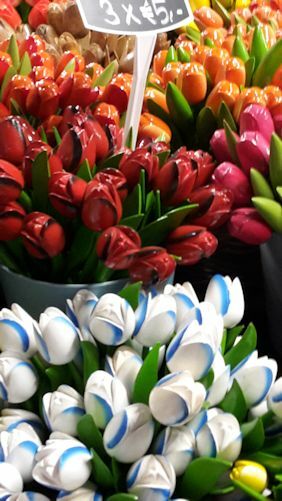 We needed to buy some soya milk so we were advised to visit the Albert Heijn supermarket https://www.ah.nl/ at the Flower Market, a short walk from the hotel down the main drag Leidsestraat. After asking where the ‘free from’ section was, we were shown to a shelf with very few ‘free from’ items – no bread, for example, although we bought some Nak’d bars https://www.naturalbalancefoods.co.uk to keep us going, although there was soya milk. The best source of ‘free from’ food was Holland & Barrett in Leidsestraat, https://www.hollandandbarrett.com which stocks a wide range of Schar ‘free from’ products www.schaer.com including biscuits and cereals. This was by far the best selection we found. 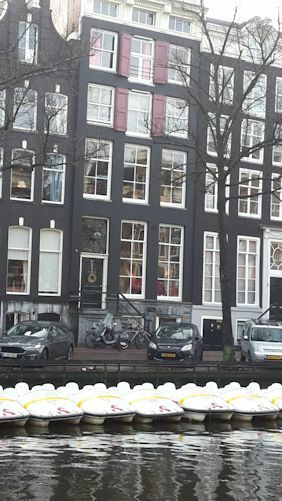 Before our trip, I’d researched gluten free and dairy free restaurants in Amsterdam, but I had no way of knowing whether they would be near our hotel. 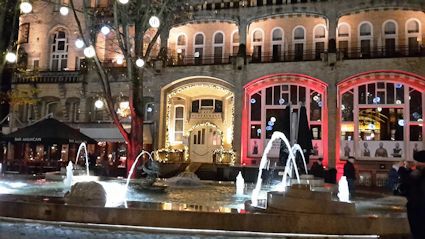 We consulted the concierge who indicated the nearest restaurants to the hotel, as well as giving a couple of recommendations. When we explained we were looking for restaurants that served gluten free and dairy free dishes, his reaction was “It’s not easy”. Our first choice of restaurant was Haesje Claes http://www.haesjeclaes.nl/ as I’d been told they have a gluten free menu, but they were full, so I booked a table for the following evening which was Ray’s birthday. We then trawled the streets for a good hour looking for somewhere we could eat; usually the menus on display showed that the restaurant was unsuitable for us. We tried Café Luden but were told that everything in the menu has “milk sugar” in it. “Have you got an allergy to lactose or milk sugar? Milk sugar is in an ordinary stock cube and everything served at the restaurant has it.” We discovered that “milk sugar” is another word for lactose. So we moved on – and so it went on until I suggested trying one of the concierge’s recommendations. Our best discovery on this trip was Campo de Fiori http://www.campodefiori.nl/?lang=en Despite it being busy, we were welcomed into the restaurant and they managed to fit us in. I started the conversation by saying “I’ve been sent here because you have a gluten free menu”. This was well received (unlike some of the other restaurants we tried) and the waiter took me through the menu showing me what I could have. He did the same for Ray with the dairy free dishes. Unlike many restaurants, we weren’t made to feel “different” and “awkward” as is often the case. Without prompting, they brought me gluten free bread. My gluten free pasta with Bolognese sauce was delicious. 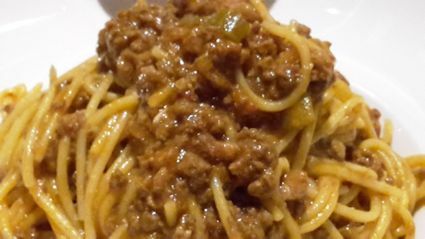 The pasta was perfectly cooked al dente – a pleasant surprise because sometimes gluten free pasta can be under-cooked. 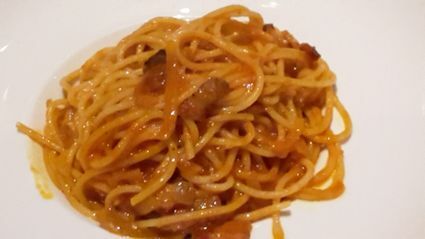 The chef made a special sauce for Ray “amatriciana” – a pork sauce similar to carbonara but without the egg, which he enjoyed. 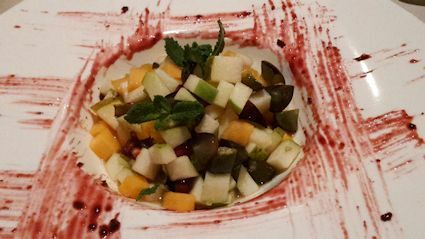 For dessert I asked for a fruit salad which they made specially as it wasn’t on the menu. Wandering round Amsterdam, we couldn’t believe how many cyclists there were and the huge number of parked bikes on the street. 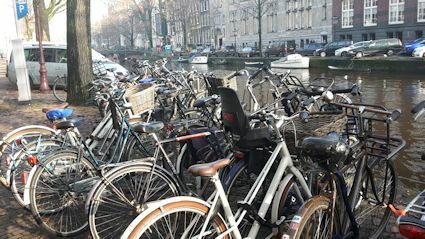 Apparently there are some 881,000 bikes in Amsterdam, with each household owning at least one. On one occasion we saw pedallos on the canal. Pedallos in Amsterdam. Really? 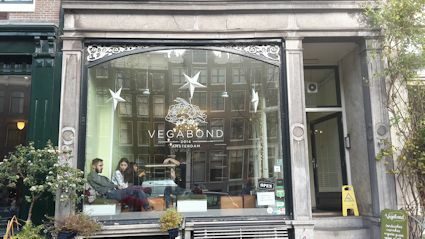 Vegabond http://vegabond.nl/ vegan store and lunchroom was recommended so next day we decided to visit for lunch (it closes 7pm most days). Ray couldn’t believe that everything on the menu was dairy free and had to keep checking that this was really the case whereas I had to be vigilant because not everything is gluten free. A wide range of ‘free from’ groceries is on sale. We both ordered “Reviving Red” – beetroot, apple, carrot and ginger juice (4.5 euros), which was very refreshing as the name suggests. 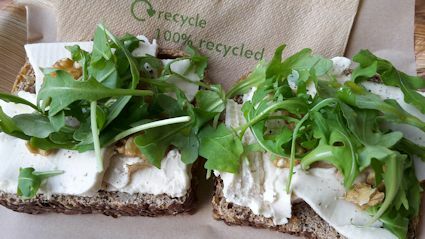 Ray’s choice was a spelt sandwich with artisan almond “brie”, fig jam, rocket, lettuce and walnuts (7.5 euros). He was very impressed with the wonderful cream “brie” cheese made of almonds. 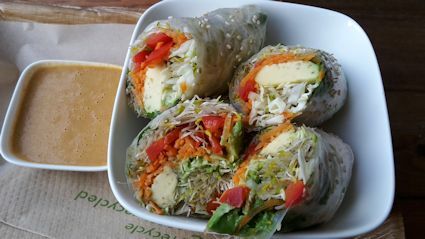 I ordered Summer rolls made of gluten free rice paper with avocado, raw vegetables, cucumber and sesame served with spicy peanut sauce (7.5 euros) – delicious. 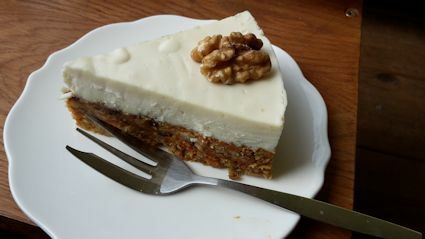 Vegabond has an excellent choice of ‘free from’ desserts but when we saw the raw carrot cake, we just had to order it (3.5 euros a slice) – it truly does melt in your mouth. (Oddly, there is no toilet, but you can use the loo at the hotel next door for 50 cents). Getting about in the city by tram is the best way. It’s not only convenient and fast, but a great way to see the city. From our hotel we had the choice of tram 1, 2, 5 (handy for the railway station). You can buy tickets on board the tram and change is given. For a single trip it’s 2 euros 90 cents (the ticket lasts an hour) or a one day ticket is 7.50 euros. Tickets much be checked in and out on the machines inside the tram. 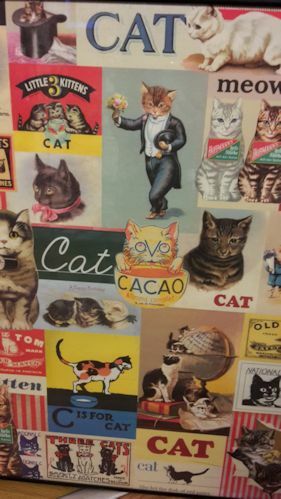 We enjoyed exploring the quirky individual shops although there seemed to be fewer than previous occasions, although there were plenty of “cannabis” shops selling all manner of items such as cannabis chocolate! The high street seems to be dominated by chains as is the case in most major cities these days. We were disappointed by the Flower Market, which mostly sells pre-packed items for tourists rather than a vast array of flowers which we saw on previous visits. 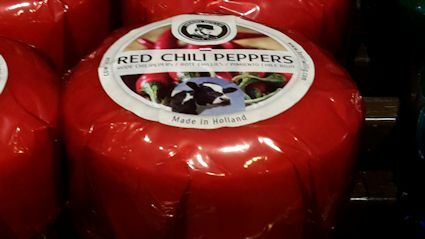 It’s great fun browsing cheese shops such as Henri Willig http://www.henriwillig.com/en/ (unless you’re dairy free of course) and trying out all the various types of cheeses, mixed with herbs and spices – great to take back as a present. Friends of Art www.artnl.com sells a vast collection of unusual postcards, posters and gifts – well worth a visit. 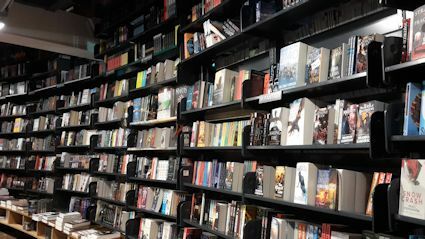 One of our favourite shops is The American Bookshop https://www.abc.nl/ which is a cornucopia of books (all in English!) on several floors so you can easily while away hours here. It’s open late - an added bonus. Ray discovered this some years ago during a work trip. Just near this shop is Haesje Claes www.haesjeclaes.nl , where we dined on Ray’s birthday. Housed in a 16th century building, this restaurant offers a gluten free menu. Whenever restaurants offer a special menu, we always hope this is a good indication that they understand about food allergies. It has several dining rooms, connected with small halls, stairs and corridors so it can be easy to get lost if you slip away to the bathroom. The interior consists of oak wooden panelling, glass lead windows, Delft tiles and gold leather wallpaper. A main course, on average, costs 17.50 euros. 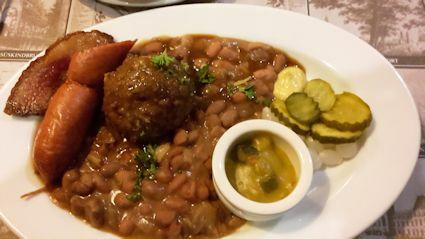 I received a gluten free menu and ordered the seabass, while Ray had the famous meatballs, sausage and bacon. He checked whether the dish had any milk in it and was told there was no milk in the sausages, just soya. So that was good news. 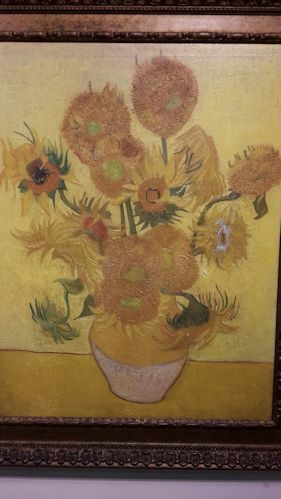 The Van Gogh Museum https://www.vangoghmuseum.nl/en houses the largest collection of art by Vincent van Gogh in the world. This includes 200 paintings, 500 drawings and over 700 letters. The collection is beautifully presented in the museum, which has been renovated since our last visit. 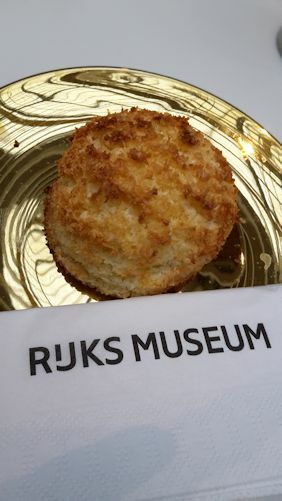 The museum also holds special exhibitions such as “The Dutch in Paris 1789-1914” which we visited. At the museum’s Tambourin Cafe we had to ask someone to explain the symbols displayed on the labels accompanying the food and tell us what was gluten free and dairy free, as it wasn’t obvious. 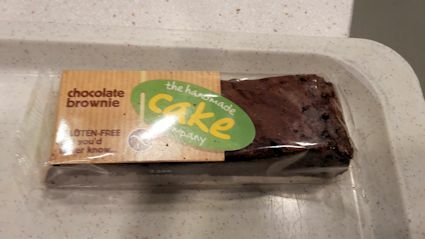 Incredibly I was presented with a gluten free brownie made by UK firm The Handmade Cake Company https://www.handmadecake.co.uk/ so at least I knew the cake would taste ok. The tomato soup was gluten free and dairy free, so Ray ordered a bowl. He checked whether the bread and croutons contained milk. They didn’t. 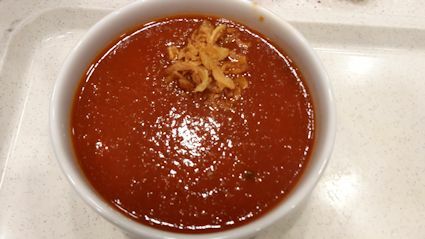 Ray also sprinkled dried fried onions in the soup, which was very tasty. Getting a cup of tea was problematic. The café’s espresso machine had broken and they only served soya milk downstairs in the “to go” area where you had to stand up. So I went downstairs, fetched two teas with soya milk, to bring upstairs on the escalator only to be stopped by security. I had to explain it was for the café as the espresso machine was broken, so he agreed to let me enter! When we travel overseas, our aim is to try out local restaurants, but if we are having difficulty finding anywhere, we will opt for a chain. 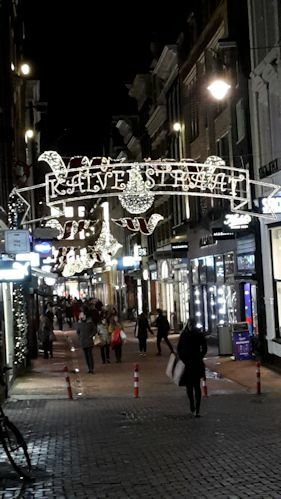 As it was freezing and we were starving, when we saw the Wagamama https://www.wagamama.nl/en sign, we went inside – there are four in Amsterdam. When we explained about our allergies, we were presented with an allergen chart in Dutch. As we knew the words gluten free is glutenvrij and milk is melk, we could identify which dishes we could eat. I waded through the entire chart to find out that there were only about four dishes without gluten. You’d think the staff would have been able to show me straightaway which dishes didn’t have gluten as there were so few. Note to Wagamama – tell us what we can eat not all the things we can’t. A menu with symbols would be simpler. It wasn’t very reassuring when they said they would “try” to keep everything separate. 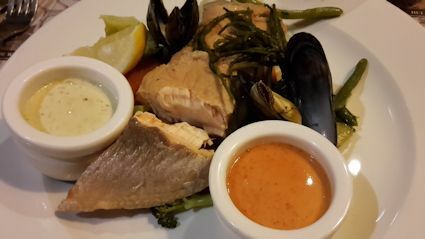 At the same time, we waited for a long time for our food and when we asked, we were told because of the allergies the chef had to prepare the food in special pots and pans. Full marks to the waiter explaining this to us. 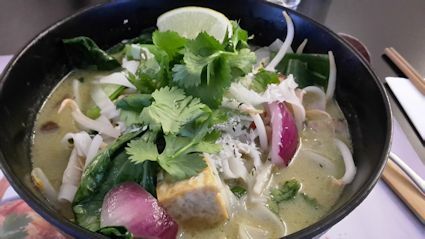 I ordered Yasai Itame which is not only gluten free but also vegan – rice noodles in a spicy green coconut and lemongrass soup topped with tofu and vegetables. I was unable to have the chicken variety because there was gluten in the marination process. 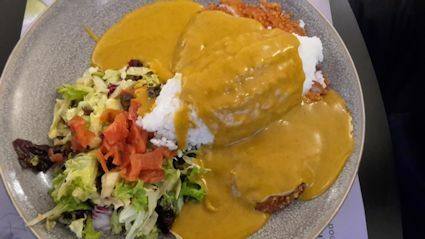 Ray’s choice was chicken katsu curry which was milk free on the allergen chart, although he double-checked. The food was just the job on such a cold day – so at least I know what to order next time. 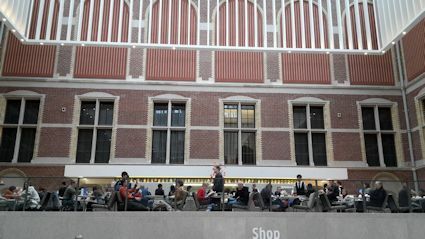 A visit to the Rijksmuseum https://www.rijksmuseum.nl/en was must, as our hotel was so close. This museum is dedicated to the history of the Netherlands with over 8,000 paintings, statues and artefacts in its collection. This includes works by Rembrandt, Frans Hals and Johannes Vermeer including Rembrandt’s Night Watch and Vermeer’s The Milkmaid. Another highlight is The Cuypers Library, the biggest and oldest historical art library in The Netherlands. 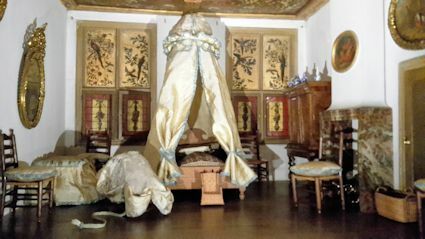 I particularly liked a collection of early dollshouse interiors by Petronella Oortman (1686-1712). All the contents were made using authentic materials. 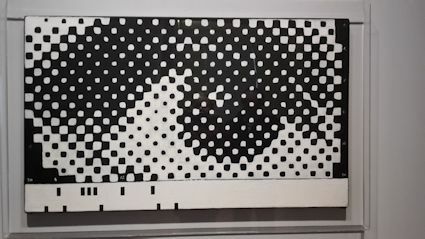 We also found a modern art exhibition with this intriguing exhibit - untitled 1965 by JCJ Vanderheyden which looks like black and white cells until you look at it from a distance and see an eye. The museum café is open plan, located upstairs at the entrance of the museum. Curiously it is table service and apart from a very crowded tiny coffee bar inside the museum, is the only place to get refreshments. The good news is that they served soya milk! When I asked if there were any gluten free cakes, I was told there was a coconut and lemon cake. Ray was told there was nothing he could eat as everything had dairy. He joked that at least he could enjoy watching me eat my cake. As he said this, the waiter said he could eat it as there was no dairy in it! 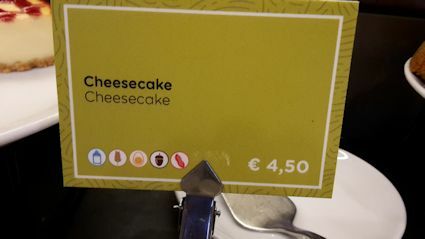 Very confusing, but we ordered a second cake. Sometimes something simple can become very complicated. Our tea was served with little biscuits which weren’t gluten or dairy free, so why were we given them? 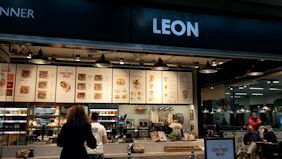 On our way home, as we walked from the railway station into the Amsterdam airport terminal, we were pleased to see Leon http://leonrestaurants.co.uk/ , one of our favourite UK chains, has an outlet. What a pity it isn’t inside the departures lounge or better still, in the city centre! Have a great Christmas and see you in 2018! There are no comments yet, be the first to write a comment.